Spätzle is a dumpling made from flour, eggs, and a liquid (such as milk, or sometimes water). The name is Swabian (High) German, and translates as ”little sparrow” (someone must have thought the shape looked sparrow like). You can find virtually the same dumpling throughout Central Europe, although it may be called by a different name. For example, in Hungary it’s Galuska. In Switzerland, Chnöpfli or Knöpfle. These plump little dumplings combine perfectly with hearty stews. Or you can serve them as a starch to accompany meat or seafood. They’re easy to make, and you can prepare them ahead of time (just reheat with a quick simmer or sauté right before serving). So they’re perfect for company, since they require no complicated last-minute preparation. And the flavor of spätzle is satisfying and comforting. Just like the adulation you’ll get for making these little gems. To make spätzle, you mix flour with eggs and milk (or water) until you have something that resembles very thin biscuit dough or very thick pancake batter (you can vary the consistency by adding more or less liquid). You form this batter into dumplings, which you then boil briefly (a couple of minutes). The only tricky part is shaping the dumplings. There are several ways to do it. The no-equipment method involves scraping the batter onto a damp cutting board. Then, using a spoon or knife, you form ½-inch long pieces of dough that are approximately the thickness of a chopstick, and “flick” them into a pot of boiling water. The ideal way is to use a spätzle maker. These have a container to hold the dough, a bottom with holes of ½ inch or a bit less, and a mechanism to force the dough through the holes, forming the dumplings. I have the rotary kind (pictured below; it looks much like a food mill). There’s also a type of spätzle maker that looks like a big cheese grater, with a hopper that holds the dough (see picture at Amazon. You can also use a colander that has large holes (use the back of a spoon or a spatula to force dough through it). If you find yourself making spätzle often, you’ll definitely want to get a spätzle maker (they’re not expensive — the one pictured at Amazon is about $10). 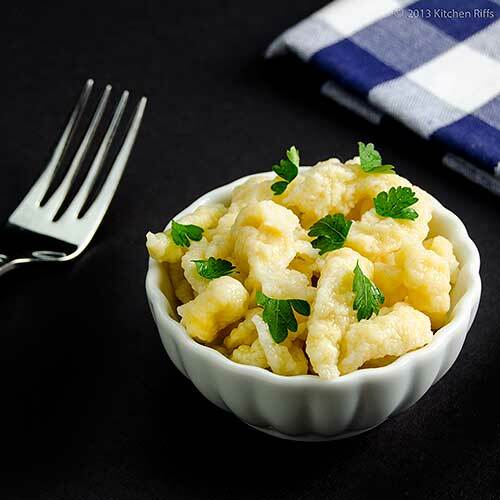 The biggest variable among spätzle recipes is the quantity of egg specified, which can vary from 1 to 2 eggs per cup of flour. My recipe (which uses a bit more than 1 egg per cup) is adapted from one that Dorie Greenspan published in the March 2006 issue of Bon Appétit. You can mix the batter for this recipe in about 5 minutes. But for best results, you should let it rest for at least an hour, or even overnight. (This allows the gluten in the flour to relax, creating a more tender dumpling.) Cooking the dumplings takes only about 2 minutes, though you’ll probably end up doing it in 2 batches. So from start to finish, figure at least an hour and a quarter, including resting time. This recipe makes 6 to 8 servings as a side dish (but be aware that people tend to eat more of this than you expect). Leftovers keep in an airtight container in the refrigerator for a couple of days. This procedure assumes that you’ll be serving the spätzle immediately after cooking. See Notes if you want to cook these dumplings several hours ahead, and then reheat right before serving. Place flour in a medium bowl, add 1 teaspoon salt, and whisk to combine. Break eggs into a small bowl, and whisk briefly. Add milk and whisk to combine. Pour milk and beaten eggs into the flour and salt mixture, and with a wooden spoon stir until you form a batter (it will be soft). Ideally, you should let the batter rest in the refrigerator for at least an hour (cover the bowl with shrink wrap). But if you’re in a hurry, you can form and cook the dumplings right away. When ready to cook the spätzle, place a big pot of water on the stove and bring it to a boil. When boiling, add about a tablespoon of salt to season the water. If using a spätzle maker, scrape the batter into the hopper or bowl (you’ll probably need to do this in two batches). Turn the crank (if it’s a rotary spätzle maker) or slide the bin back and forth (if it’s the cheese grater kind), and the dumplings will form automatically. If you don’t have a spätzle maker, you can use a large-holed colander, using a spoon or spatula to force the batter through the holes. Drop the spätzle into the boiling water and simmer until done — about 2 minutes (they’ll be cooked through and still tender). 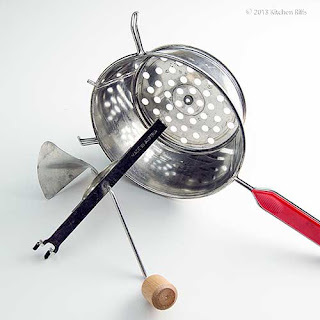 Remove cooked spätzle from pot with a fine mesh strainer or perforated spoon. Place them in a bowl, add a couple of pats of butter, and toss. Repeat Steps 6 and 7 until you’ve used all the batter. Add a bit more butter if you wish, sprinkle with optional parsley, and serve. When ready to serve: Bring a pot of water to a boil, add spätzle, and simmer until warmed through (a minute or less), and proceed with Step 8. Or if you prefer, melt about 2 tablespoons of butter in a skillet, add spätzle, and gently sauté until nicely browned. Then serve (with an optional sprinkling of parsley). Whole milk makes the best spätzle, although you can substitute skim or even water. The spätzle won’t taste as rich, however. The first time you make this recipe, I suggest using the amount of liquid specified (¾ cup). If the consistency of the batter isn’t to your liking, next time either add a bit more liquid (if the batter was too stiff) or a bit less (if it was too runny). Eggs carry a slight (but real) risk of salmonella. So I suggest using pasteurized eggs for the batter. Although it’s unlikely that the eggs you buy will be infected, why take the risk? Especially if you decide to taste the raw batter (I often do). You can easily identify pasteurized eggs because they usually have a red “P” stamped on them. You can add green herbs to spätzle if you like (Greenspan’s recipe calls for them, although most traditional recipes don’t). Just chop a tablespoon or two of parsley or another fresh herb, and mix in with the milk and egg in Step 2. Spätzle can work well as a starch to accompany meat or fish. If you’re serving spätzle this way, they’re great au naturel with just a few pats of butter to flavor them. You can also brown them in butter (see second Note); their surface will get a bit crispy (reminiscent of Chinese pot stickers). Don’t be surprised if people ignore the expensive protein on their plates and instead concentrate on the dumplings — they’re sort of habit forming. Spätzle are at their best when accompanied by gravy of some sort, especially one with a central European flavor. I most often associate spätzle with the cuisines of Hungary or Austria. In Hungary, a meal featuring spätzle might start with a nice Hungarian Cucumber Salad. This would be followed by a spicy pörkölt (pronounced pur-kult), a hearty paprika-based meat stew with a flavorful gravy. Spätzle makes an ideal complement to this dish because it helps soak up the gravy. Many people in the US might know pörkölt as goulash. In reality, however, goulash (from the Hungarian gulyás) is a separate dish altogether. It tends to be soup-like, and often includes potatoes. And if it contains noodles (it often does), they’re cooked in the gulyás itself, not served alongside (as spätzle is with pörkölt). The two dishes do have similar flavors, though. 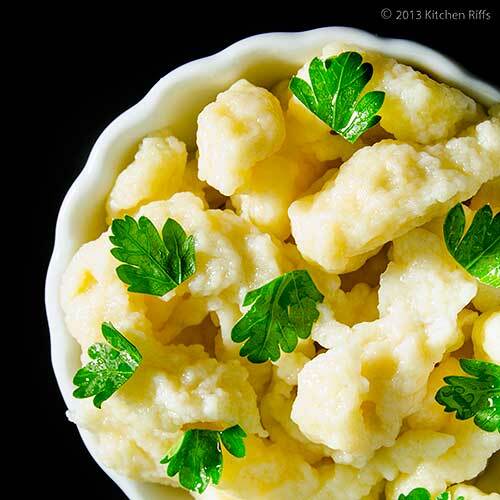 Because pörkölt is virtually designed to be eaten with spätzle, we should probably make some, don’t you think? And we will – later this week. This dish is one of my husband's favorites (he is originally from Germany). Thank you for this! If I could eat spätzle every day, I would! So simple, yet so delicious and comforting. Love this post! Hi Kristi, if you haven't made these, you definitely should! So tasty, and your husband will love them (and you too, of course!). Thanks for the comment. Hi Kimberly, I'd love to eat these every day too! Of course I'd be enormous if I did, but it'd probably be worth it. ;-) Thanks for the comment. This looks like so much fun to make. I, too, really like your sauteed version. I wish I could bite into one right now! This is definitely comfort food! I had this for the first time a few years ago while I was in Germany and was wondering why don't we have this dish in Canada! So creamy and delicious. Hi Abbe, aren't these nice? Really tasty, and so satisfying! Thanks for the comment. Hi Kristi, these are really great! Well worth making, IMO. ;-) Thanks for the comment. Hi Natalie, you find this dish all over Europe. Fortunately, it's an easy dish to make at home, so we can enjoy it here, too. Thanks for the comment. Hi John, what a post! The moment I saw the first photo from the top I was magically transformed into my grandmother's kitchen. She use to make those for us, kids, quite often. You know kids can be picky in what they like or not to eat. This dish, and soup made with it, was an all time winner: no one complained and all plates were clean. And in soup is my favorite way to eat Spatzle/Galushki/Klyotski/Kneidl - you name it! Ooh, you've got me sold! Gravy sounds amazing at this moment. Any recommended pörkölt recipes? Aw you made me think of my grandmother; she made this for us as kids and I hate to admit...I've never made it myself. Brings back great memories though and on this day, that's good enough. Hi Marina, I'm happy to send you back to your grandmother's kitchen! And you're so right that essentially the same dumpling is found all over the world. Food anthropology is so interesting, isn't it? ;-) Thanks for the comment. Hi Ala, I'll have a great pörkölt recipe later this week. ;-) And gravy always sounds good! Thanks for the comment. Hi Uru, this really is a fun - and delish! - dish. ;-) Thanks for the kind words, and the comment. Hi Barb, isn't the food of our grandmother's so enticing? This is well worth making yourself, IMO, although I know I've seen packaged spätzle in the grocery store (I've never tried it, so I don't know whether it's worth having). Thanks for the comment. Spatzle is such a good "to go" recipe for a quick dinner, it's been years since I've had them, thanks for the recipe! It seems like I have had something like this when I was small in a roast stew and I remember loving them. Your recipes are always savory & exquisite!! And I always learn something new! I didn't know this; it looks so tasty! I have to try it. I've heard that some people have had success using a colander to push the dough through. I haven't tried it, myself. But it sure does sound inventive when you don't have a spaetzel press on hand. Hi Ilke, it's amazing what one can do with dough! And it's all so good. ;-) These are terrific! Well worth trying. Thanks for the comment. Hi Gourmantine, you really can prepare these in a hurry. Until recently, we hadn't had these for years, either. Now we can't get enough of them! Thanks for the comment. Hi Judy, these really do go well with anything stew-like because they're such little gravy sponges! Thanks for the kind words, and the comment. Hi Alex, glad to introduce you to a new dish! Enjoy. ;-) Thanks for the comment. Hi Carolyn, the colander method works pretty well. I'm happy that I have the press though, and they're not expensive (although it's a one-use gadget, something I usually avoid). Thanks for the comment. Hi Charlie, this is a slightly messy recipe, although there's usually no big splash (well, not the way I do it!). But good point that this isn't a recipe for kids to try. Thanks for the comment. Four years of marriage to a Hungarian foodie - four years of making galuska simply and often, always over a colander, flicking a knife back and forth below :) ! Lot of fun and not messy at all once one has had a tad of practice!! That was awhile ago: must really restest my skills :D ! I am a huge fan of spaetzle...and your sauteed version is making me VERY hungry! This needs to be back on the menu ASAP! Hi Eha, that practice thing is always the key, isn't it? ;-) And you know you owe it to yourself to retest your skills! Thanks for the comment. Hi Liz, I like these little dumplings plain or sautéed — basically any way I can get them! Thanks for the comment. Coming from the south, I'm very familiar with dumplings but I've never had spatzle. I do see that the main difference between southern dumplings and spatzle is the egg. We don't use eggs in our dumplings. I do like the addition of them however. I would imagine that they would produce a lighter dumpling. Your sauteed spatzle really has my interest and serving spatzle with pörkölt, would definitely be a must. I do love pörkölt! Can't wait to see you recipe! Hi MJ, I know the kind of dumpling you're familiar with, and yes these are lighter. Otherwise the flavor is quite similar. Thanks for your comment. I have never had spatzle, but it is very close to the recipe that my family uses for dumplings. They sound delicious. Hi Dawn, dumplings are pretty much dumplings - there are only so many ways you can make them! ;-) But so many different names for them! Thanks for the comment. Thanks for another great recipe and post. I really enjoy spaetzle but haven't invested in a spaetzle maker yet since for some weird reason my husband just isn't crazy about the dish! Which I find very odd since I love them! Yours look just perfect, and I especially love the look of the sauteed ones. Hi John, I hear you abut not wanting another kitchen gadget — if I didn't already have a spätzle (acquired years ago when we made it quite frequently), I doubt if I'd get one. It's easy enough to figure out a way to make them without. Thanks for the comment. Hi Raymund, they're wonderful when browned like that! They make a great side dish. Thanks for the comment. Hi Katherine, spätzle are wonderful — I'm surprised your husband isn't that keen on them! More for you. ;-) Thanks for the comment. Hi Judy, it's really hard not to have seconds with this dish! Or even thirds. Just to be sure. ;-) Thanks for the comment. Hi Rosa, ah, good to hear that they're called Spätzli in Switzerland. And it's such a yummy dish, it's delish no matter what it's called! Thanks for the comment. I have to say, I don't think I have ever had Spaetzle! Reminds me of chicken and dumplings or even some pastas! Hi Alyssa, these are just a variety of dumpling, so they're quite similar to chicken and dumplings. So you know they're really good! Thanks for the comment. 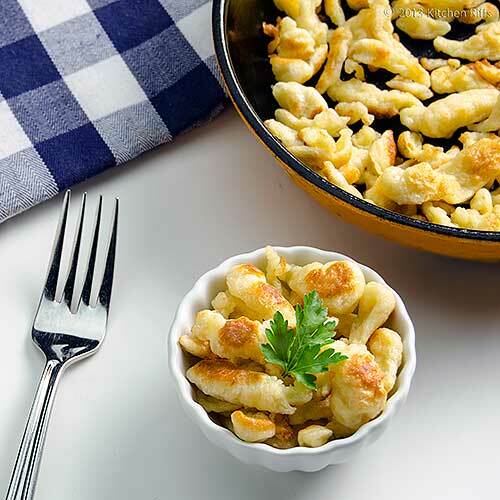 Mmh, Spaetzle are one of my favorite childhood memories! They are very popular in Austria and my grandmother used to cook them often. 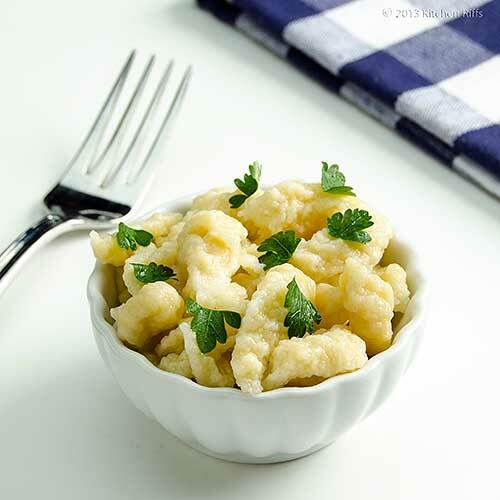 Must confess that I never tried to prepare Spaetzle but with this great recipe I will! Hi Daniela, isn't this such a tasty dish? And they really are pretty easy to make, although (at least for me) a bit messy the first time or two. Thanks for your comment. New follower to your blog.. If you get a chance, visit my blog..
Hi gayathri, it's really a great dish! It may be new to you, but once you taste it, it will become an old friend. ;-) Thanks for the comment. Spatzle is new to me, but I am sure it must have tasted awesome! I love experimenting with food and the photograph looks lovely! First - this is simply grand. I have never made these - I don't form things well with my hands! Had no idea there was a spatzle maker. And now I realize - that this contraption that my mother had - was indeed one - and we didn't know and gave it away. Grrr! This would be a good skill to have - because these are so darn comforting and if we need anything in MN during the 6 month winter - it's comfort. Hi Purabi, this is a dish that's really worth getting to know. It might sound a bit weird, but I think it'd go quite well with some of the Indian dishes that have a rich sauce. Thanks for the comment. Hi Ali, it's a fun dish! And if you like dumplings (who doesn't?) you'll like these. ;-) Thanks for the comment. Hi Claudia, these are great for snowy winter weather! Too bad about your mom's spätzle maker. But if you get into making these, you can find decent ones that aren't expensive. Thanks for the comment. I've never had this before but it's similar to something we make here called sliders. Which I love. So I think I'd love this too. In fact I'm sure it's 2 or 3 bowl worthy. Hi Kim, sliders in the US are greasy hamburgers, like the White Castle chain makes. Although of late "sliders" have become more upscale, and are just small hamburgers. Interesting to learn that in Canada it's a dumpling- or noodle-like dish! Thanks for the comment. OMG I love spatzle - I've only ever had it at a German restaurant nearby, but I would love to attempt on my own. Great post! Hi Dara, isn't this good stuff? And it's pretty easy to make, too. Thanks for the comment. Spätzle Maker! That is a really cool gadget to have at home! Okay today is my day to learn new dishes at your site as I've never tried spatzle before too! I think I've seen this dish before though, somewhere, not in restaurants so maybe someone's blog... I now wish to taste this! Hi Nami, it's really tasty stuff! And reasonably easy to make without a spätzle maker (although you'll want to buy one if you make it on a regular basis). Thanks for your comment. Hi John, I have been unable to comment on anyone on blogger for awhile, but hopefully the glitch has been fixed and this goes through. Your meal looks terrific...I am having something similar for this evenings meal. I love spatzle and enjoy it often when we travel to Germany and Austria. Hi Karen, it went through! Blogging software gets buggy sometimes, doesn't it? Anyway, isn't this incredibly good stuff? We haven't made it for awhile, and now that we tasted it again, Mrs K R is lobbying to make this again, and soon! Thanks for the comment. Hi Terra, this is a bit tricky (and messy!) to make the first time or two, but it's something that's pretty easy to figure out. And it's so good, you'll want to - so you can make it often! We're having it again this coming weekend. ;-) Thanks for the comment. I once had spatzle at a fine dining restaurant many years ago and it was sooo good I've never forgotten the taste. Good to how its made! Hi Christine, isn't this good stuff? And it's really so easy to make! It can be a bit messy to make sometimes, but totally worth it. Thanks for the comment.